Making pasta from scratch doesn't need to be difficult. With this recipe and five ingredients we show you how to make pappardelle, fettuccini and farfalle. 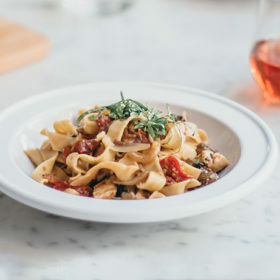 In a bright, modern kitchen set above the bustling traffic in New York City’s Little Italy, Carmine DiGiovanni keeps the rosé flowing as he teaches classes on how to make fresh pasta. Downstairs, less DIY-inclined customers eat DiGiovanni’s creations at Aunt Jake’s restaurant. Here, he teaches us his recipe. This dough can take on just about any shape you like, be it lasagna, stuffed pasta or more, but we’ll take you through three basic shapes and teach you three dishes to make with them. With your hands, roll dough into a loose 1-inch thick tube. Cut crosswise to form 1-inch-wide ribbons. Unroll before cooking. Follow directions above, except cut into ¼-inch-wide ribbons. Use tip of sharp paring knife to cut sheet into 2-inch squares. Pinch each square using thumb, pointer and middle fingers. Keep pointer in center of square, while thumb and middle finger pull sides together to resemble bow tie.